"Extraordinary Ceramics : Fantastical Wonderland"
Ahryun is a ceramic artist, designer-maker and skillful craftsman. 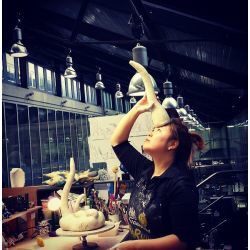 Recently graduated from Royal College of Art, UK (2016), having studied ceramics in South Korea and UK, she explores numerous creative possibilities by embracing different perspectives between East and West. Her interest is to find the new possibilities in ceramics, in which ways ceramics can be developed. While peering into the area between tradition and contemporary, her objective is to create something extraordinary piece which draw a question about vague boundaries between Craft, Design and Art.